Our lake house is situated on 1.5 acres just 250 steps to the Cove Road boat launch on beautiful Amston Lake. 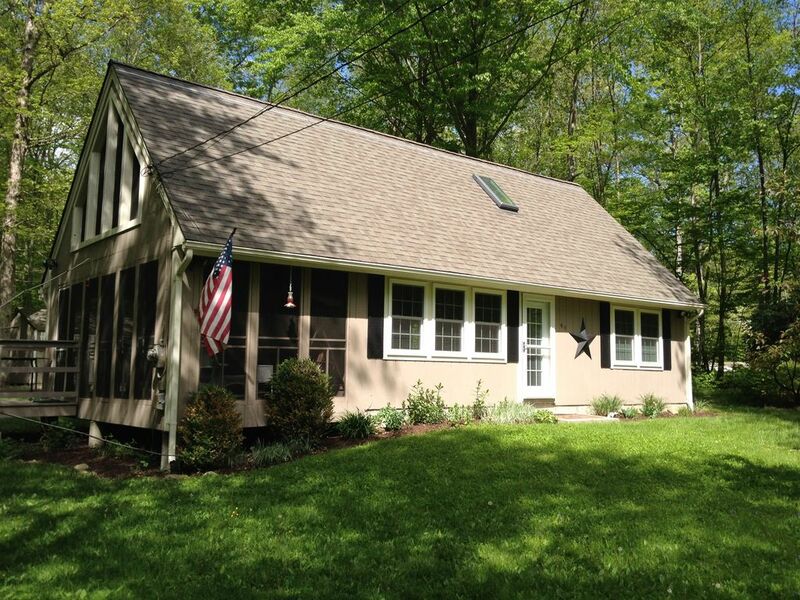 The lake is a pristine 188-acre retreat located in Lebanon and Hebron, CT. Swimming, kayaking, canoeing, paddle boarding, fishing, and sunbathing are all activities you can enjoy. There are no motor boats allowed so you can enjoy all of those activities in a peaceful environment. Two beaches are located 1/2 or 1 mile away from the cottage with ample parking at both should you choose to drive. The house is 850 square feet of pure cottage enjoyment. There are two bedrooms with a queen-sized bed in one and a full and twin in the other. A sixth person could sleep on the sofa. There is one bathroom with a shower and a washer and dryer. There is a full kitchen and a gas grill for cooking. There is one television with cable and wifi. Our cottage doesn't have high-end finishes, but it is clean and comfortable. It's a cottage, and it feels like a cottage, especially when you are sitting on the porch swing, enjoying a cold beverage, watching the bird feeder, and reflecting on the day. Or sitting around the fire pit with friends and family, while sharing stories and roasting marshmallows. It feels like you are in the middle of the woods. One of my friends always tells me he loves to come to the cottage because it feels like camping but with running water. We have a canoe and two kayaks for you to use, two bicycles, a few beach chairs, and some lawn games. Lebanon is a beautiful, rural community with several operating farms. Amston Lake is on the edge of the Airline Trail where you can enjoy hiking and biking for miles. The Connecticut casinos are about 30 minutes away. Outlet shopping is located at Foxwoods Casino or in Clinton and Westbrook. The CT and RI shore are 40-60 minutes away. New York and Boston are about 90 minutes away. We are close to so much, and yet you will feel like you are far away from it all. We hope you enjoy your stay! I am a resident of Hebron, so I am nearby if you need any assistance. I am a high school librarian, and I enjoy spending most of my summer out of doors at the lake. I grew up locally in East Hampton, but have had the opportunity to travel far and wide (4 continents and 27 countries). I lived in two other regions of the country. I attended school in Virginia and stayed in the Fredericksburg, VA area for 15 years, and I also spent three years in Minneapolis. I'm happy to call New England home right now. I really enjoy lake living. I also enjoy a private, wooded lot. This house offered both of those things. Dirt roads for walking and a beautiful lake for paddling. I hope you find this cottage as peaceful and inviting as I do. The cottage is a 30 minute drive to the CT coast and 45 minutes to Rhode Island beaches. Hebron, Lebanon, and Colchester are all quaint Connecticut towns with town greens, shops, restaurants, and historic buildings. The property has a very limited lake view. We are 250 yards from the lake. One large air conditioner on main living level. One small air conditioner in upstairs bedroom. Whole house furnace and gas fireplace in main living area. Electric heaters in bedrooms and bathroom. Must be washed at checkout. Must be washed at checkout. Six bath towels and six beach towels are provided. Portable radio and cd player. Speaker system that you can plug a device into. Owner was very easy to work with and responsive to questions and unexpected snow. Cottage was clean and comfortable. Stocked with lots of extras that other VRBO's I've stayed in didn't have. Felt like home. Thanks! Cute, clean cabin... wonderful weekend getaway! This cabin was exactly what I was looking for! Needed a weekend away to enjoy some peace and quiet. This cabin was cute, tastefully decorated, extremely clean, and had beautiful grounds! The bed was comfortable and the amenities provided were plentiful! Enjoyed my weekend at this cabin retreat! Thank you Todd! You were extremely accommodating and helpful. Thank you again! I’m so glad the cottage offered you the break you needed! Come back when the weather is warmer and you can enjoy the lake. Nice quiet place for the Holiday. Owner very nice. Todd was great. Cabin was just as advertised! Very relaxing, clean, comfortable ! Good location! Thanks David. You were a great guest! I’m glad you had a nice visit. Come back another time. Wanted to get away from the heat of Vegas. Forgot about the humidity. Cottage is a lovely little place with all the necessaries. Walking distance of the beach, with a bigger beach back near the entrance. Lebanon is a beautiful, rural community with several operating farms. Amston Lake is on the edge of the Airline Trail where you can enjoy hiking and biking for miles. The Connecticut casinos are about 30 minutes away. Outlet shopping is located at Foxwoods Casino or in Clinton and Westbrook. The CT and RI shore are 40-60 minutes away. New York and Boston are about 90 minutes away. We are close to so much, and yet you will feel like you are far away from it all.